ZEBULON, N.C. - Former Carolina Mudcats pitcher Eric Hanhold and former Mudcats catcher Erik Haase recently made their Major League Baseball debuts for the New York Mets and Cleveland Indians respectively. 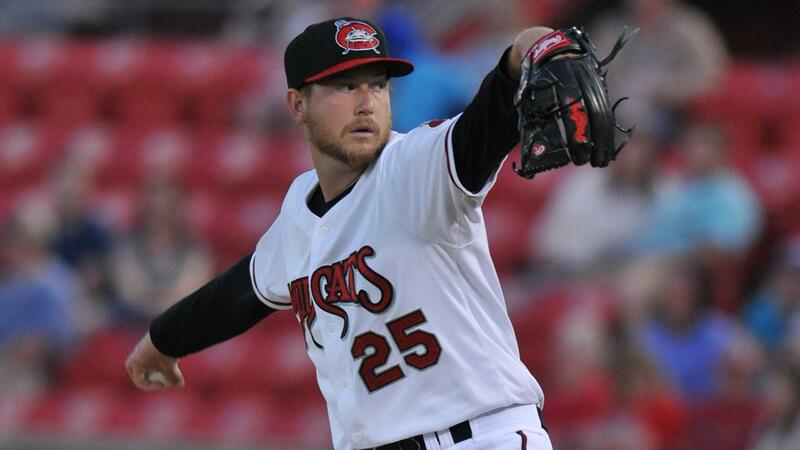 Hanhold pitched for the Mudcats during the 2017 season and is the third player from the 2017 team to receive a major league promotion this season. Hanhold, who appeared in 30 games for the Mudcats during the 2017 season, made his Major League debut with the New York Mets on September 4 in Los Angeles against the Dodgers. In his debut, Hanhold struck out one and worked through an inning and a 1/3 scoreless while pitching all of the fifth and part of the sixth innings. He also allowed one hit, faced six batters and induced two ground outs against one fly out. The Bartlett, Tenn. native went 8-3 with a 3.94 ERA over 30 games and three starts with the Mudcats last season. He also totaled 60 strikeouts, 21 walks and allowed 28 earned runs on 71 hits over 64.0 innings. Following the 2017 season, Hanhold was traded by the Brewers to the Mets on September 12, 2017 to complete a trade involving Milwaukee's acquisition of infielder Neil Walker from the Mets. He was originally drafted by the Brewers in the sixth round of the 2015 MLB draft out of the University of Florida. Hanhold, 24, began the 2018 season with Double-A Binghamton (3-1-8, 2.84 ERA, 25.1 IP, 9 BB, 32 SO) and appeared in 17 games before a transfer to Triple-A Las Vegas (2-2-0, 7.11 ERA, 14 G, 19.0 IP, 7 BB, 20 SO) on May 31. He also appeared in one game with the GCL Mets and three games with Rookie Level Brooklyn between August 3 and August 10 while rehabbing from injury. While in the Brewers system, Hanhold had previously played for the Rookie Level AZL Brewers and Low-A Wisconsin Timber Rattlers in 2015. He then spent all of the 2016 season with the Florida State League's Brevard County Manatees. Haase, who played for the then Cleveland Indians affiliated Mudcats during the 2014 season, made his Major League debut with Cleveland on September 2 against the Tampa Bay Rays. He entered the game as a defensive replacement in the top of the eighth inning and went 0-for-1 in the game. The Westland, Mich. native played in 16 games for the Mudcats in 2014 and hit .185/.243/.292 with four runs, 12 hits, four doubles, a home run and six RBI. He originally began the 2014 season with Low-A Lake County before later being called up to the Mudcats later that same year. He then remained in the Carolina League and went on to play for the Lynchburg Hillcats in 2015 after Cleveland transitioned its player development from Carolina to Lynchburg following the 2014 season. Haase, 25, played for Double-A Akron in 2016 and 2017, before then appearing in two games to close out 2017 with Triple-A Columbus. Haase returned to Triple-A Columbus in 2018 and was a mid-season All-Star and two-time International League Player of the Week. Haase was drafted by the Indians in the 7th Round of the 2011 MLB Draft out of Divine Child High School. Including Hanhold and Haase, a total of 10 former Mudcats made their Major League Baseball debuts over the course of the 2018 season. The first was 2017 Mudcats pitcher Freddy Peralta who made his big league debut for the Brewers on May 13 in Colorado versus the Rockies. Peralta was the first former Mudcats player to debut with Brewers since Carolina became Milwaukee's Class-A Advanced affiliate before the 2017 season. Corbin Burnes, who also began the 2017 season with the Mudcats, later made his first MLB appearance with the Brewers on July 10 in Miami against the Marlins. The list of former Mudcats to make their MLB debut in 2018 also includes 2012 Mudcats infielder Ronny Rodriguez (Detroit Tigers, 5/31 vs. LAA), 2015 Mudcats catcher Jose Briceno (Los Angeles Angels, 5/26 at NYY), 2015 Mudcats outfielder Dustin Peterson (Atlanta Braves, 5/28 vs. NYM), 2015/2016 Mudcats pitcher Wes Parsons (Atlanta Braves, 8/9 at WSH), 2016 Mudcats pitcher Chad Sobotka (Atlanta Braves, 8/10 vs. MIL) and 2016 Mudcats pitcher Evan Phillips (Atlanta Braves, 7/3 at NYY).